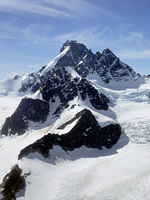 STEWART’S LODGE OFFERS AIR TOURS of the Chilcotin within a 75 mile radius of our lodge. With Nimpo Lake as the ‘eastern gateway’ to Tweedsmuir Provincial Park, we are within easy flying distance of several locales which offer spectacular views from the air. Air tours start at $100.00 per person. Review our adventure packages and call to schedule flightsee tours into your multi day adventure or at the end of your stay. Give us a call, or shoot us an email to book your very own, custom Flightseeing tour! Hunlen Falls at 1,000+ feet (305 m) is the 3rd tallest waterfall in Canada. This magnificent waterfall cascades from the north end of Turner Lake over a rugged granite precipice to rumble further on and down to Lonesome Lake below. 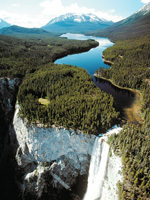 Hunlen Falls are a short 20 minutes by air west of Nimpo Lake. Your anticipation builds as we approach the Atnarko rivershed, flying over Lonesome Lake… the falls remain ‘hidden’ behind a bluff on the eastern side of a huge chasm worn by centuries of snowmelt running off mountains that surround the Turner Lake Chain. Circling around the falls, it’s a picture-perfect photo op… the falls, Turner Lake, distant mountains and more! 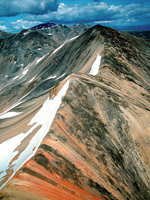 Monarch Mountain is a a majestic peak that towers 11,590 feet (3,533 m) above sea level… it’s a rugged centrepiece that presides over the icefields bordering the southern-most edge of Tweedsmuir Park. Monarch is just one of several highlights as we wing our way over deep mantles of snow and ice covering craggy rock stretching skyward… eons old glaciers lay ‘still’, inching down hidden valleys… here and there, a brilliant turquoise lake filled with small ‘bergs will catch your eye. Time and weather permitting we may be able set you down on Jacobsen Lake! A great flightsee destination, Monarch is also a ‘top challenge’ peak sought out by mountain climbers seeking the thrill of reaching a worthy summit. The ‘Painted Mountains’ is an apt description used by the early aboriginals to describe the Rainbow Range and its multi-coloured mountains and valleys. Vivid hues ranging from reds, olives, tans and blacks are interspersed with sparkling white of snow remanent on mountain ridges and carpets of green in the valleys between. Besides the colours by which this rugged range gets its name, opportunity to spot wild mountain goats, as a single or a small herd, or herds of woodland caribou is the challenge for your flight… a watchful eye will find these solitary animals that make the ‘Bows their home range. Once you’ve flown through the Rainbow Range, you may want to take a closer look on foot or horseback to explore the trails, lakes and alpine meadows ablaze in yet more colour. Remnants of a ‘build’ when the West Chilcotin was being created can be found in Itcha Ilgachuz Provincial Park. 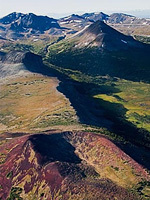 In addition to seeing extinct volcanic peaks, this air tour offers some of the very best wildlife viewing from the air woodland caribou and mountain goat.